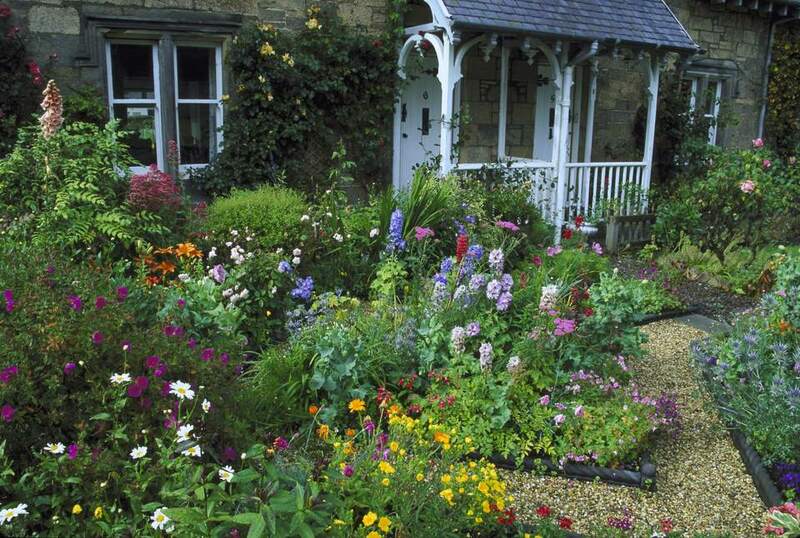 Have you ever thought about turning your front yard, a very public space, into a flower garden? Does the idea make you nervous? Some neighborhoods have a very well-defined aesthetic that centers on shrubbery and turf. You can design a front yard flower garden that complements the look of your home, allows you to show your creative side, and draws the admiration of your friends and neighbors. No matter the size of your landscape or the condition of your soil, you can achieve a flower garden in your front yard with the use of containers. When you choose containers to adorn your front porch, buy flowerpots that are at least 20 inches in diameter. Large containers create a bold statement, whereas a grouping of small containers looks like the clutter of houseplants that have been excommunicated from the kitchen windowsill. If you desire the look of a flower garden in your front yard but don’t want the daily maintenance of annual and perennial flowers, look to flowering shrubs for color. Many flowering shrubs, like these azaleas and rhododendrons, bloom in the spring. Continue the show throughout summer with a rose-of-sharon bush, and keep the blooms going until frost with a butterfly bush. Although a picket fence won’t stop determined passers-by from plucking your garden flowers for a bouquet, a fence does convey the message that viewers should only look with their eyes, not their hands. You can purchase the classic white picket fence in vinyl instead of wood for a rot-proof barrier. Other ornamental fence options for front yard gardens include wrought iron, powder-coated steel, or aluminum. If you’re lucky enough to have a grove of mature shade trees in your front yard, you may think this is at odds with a flower garden. If the limbs are high, and the ground beneath receives dappled shade, you can grow many woodland flowers, including columbine, bugbane, Solomon’s seal, or toad lily. An advantage of front yard flower gardens for many homeowners is the ability to conserve water. This garden, which includes penstemon, catmint, and scabiosa, can survive periods of drought after the plants become established. Help your drought tolerant flowers perform as they should with a three-inch layer of mulch. In addition to performing as a weed suppressant and moisture retention aid, mulch in the front landscape needs to be as attractive as it is functional. Invest in cocoa bean hulls or pine bark nuggets for the front of the border, and use cheaper mulches like straw or tree-trimming waste in the back of the border. Installing a permanent raised flowerbed is an alternative to keeping flowering containers on the front porch. Raised beds like this one look more substantial than a small pot, and provide continuity between the house and the bed even when not in bloom.